For anyone who loves garden tour holidays, Keukenhof tulip gardens in Holland will absolutely be on the top of the list. Keukenhof isn’t just the perfect destination for guests with green fingers. It’s centrally located and close to many attractions and cities and offers plenty of entertainment for children, including a maze and a petting zoo! 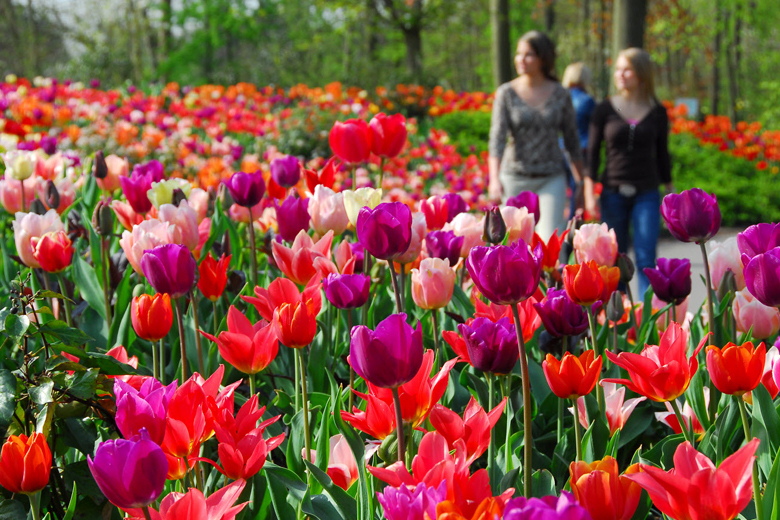 There are over 7 million bulbs in bloom every spring at Keukenhof, with over 800 varieties of tulips. This year, the gardens are open from the 23rd of March 2017 up until the 21st of May, so you have plenty of time to catch the tulips in all their glory. Tulips aren’t the only flowers on show here: there are also hyacinths, daffodils, orchids, roses, irises, lillies and many more. Each year, the gardens have a new theme, and this year it’s Dutch Design. Inspired by designers such as Mondriaan and Rietveld, the arrangements are modern and innovative. Make sure you check out the Mondriaan Garden, which has promised to be a great attraction for international audiences. The children will not be short on entertainment during their stay, with a maze, a playground, treasure hunts and even a petting zoo. After a day spent surrounded by a sea of colour, why not take them on an educational tour of the surrounding windmills. en the Hague and Amsterdam, Keukenhof is centrally located and nearby many attractions in the area. Combine it with a tour of the surrounding windmills, a bicycle ride through the stunning nature or a city trip. 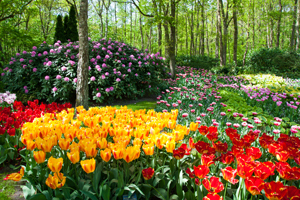 Keukenhof can be reached within half an hour from Amsterdam, Haarlem, the Hague and Leiden. All of these cities offer plenty in terms of history, culture, shopping and architectural beauty. During your visit, why not spend a day in Amsterdam exploring the winding canals, museums and shops. Haarlem is also well worth a visit during your stay, which is smaller than Amsterdam but equally rich in history and culture. 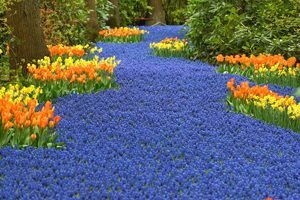 When you’ve had enough of the hustle and bustle of the city, you can enjoy the sea of flowers and bright colours at the Keukenhof! At HolidayParkSpecials.co.uk, we have a wide range of holiday parks and accommodations near Keukenhof in Lisse, the Netherlands. Whether you want a child friendly park or a pet friendly holiday cottage, we have one to meet your needs. Enjoy your stay!